Imagine taking the Dungeons & Dragons track from Origins or Gen Con, complete with a D&D designer or two, the Adventurers League brain trust, and the game’s most passionate players, and dropping it into a convention of its own. The Winter Fantasy convention has always been tied to Dungeons & Dragons. The convention started in 1977, in D&D’s hometown of Lake Geneva, Wisconsin. The co-dungeon master in Gary Gygax’s Greyhawk campaign, Rob Kuntz, organized the first Winter Fantasy. For five years, the convention even switched names to D&D Experience. 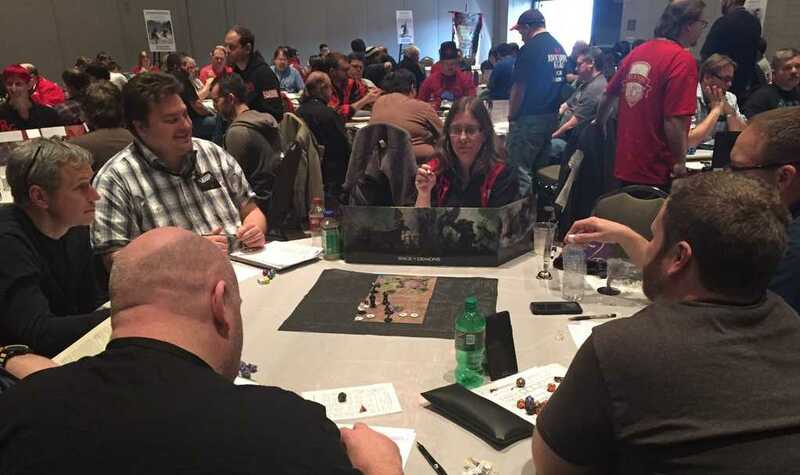 Winter Fantasy boasts as many D&D Adventurers League games as much larger conventions. Unlike Gen Con, players without advance tickets can always find a open seat. Unlike Gen Con, most tables seated six players rather than squeezing in a seventh. The convention occupies a single exhibition hall in the Grand Wayne Convention Center. With a return to the Winter Fantasy name, and free of the Wizards of the Coast corporate umbrella, the convention embraces other games. Who wants to visit Fort Wayne, Indiana in February, when the small city suffers snow and frigid temperatures? The slow season means that the cozy convention can afford a first-class facility. 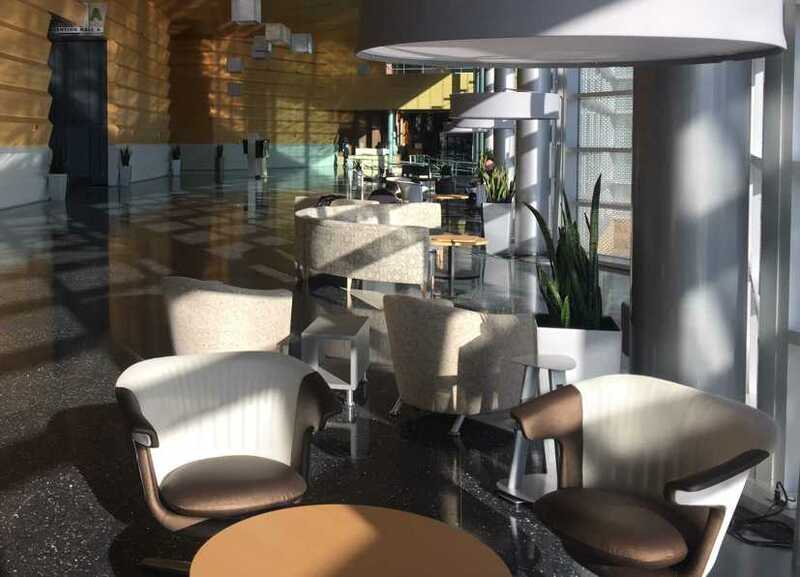 Rooms in the hotels connected to the convention center come with off-season prices. 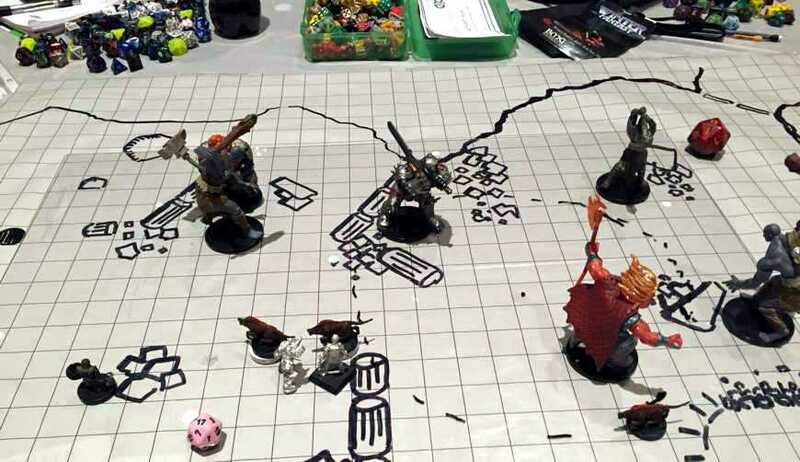 The convention debuted a new D&D Epic adventure, Reclamation of Phlan, which followed nearly all the advice I gave in “How to forge the most epic multi-table role-playing event ever.” Players could choose missions. They could seek harder encounters in their quest for glory. The event fostered interactivity by letting parties both unlock areas of the map and win benefits for other tables. Did Will Doyle, the epic’s designer, read my post? Probably not, but he surely drew inspiration from some of the same Epics and Battle Interactives that informed me. The effort and imagination Will put into this adventure stunned me. For me, this Epic’s design ranked with the best. Plus the game dominated the hall, so players could hear most of the announcements and see a projected display of the battle’s progress. This adventure featured the shtick of having a boss monster tour tables, trading attacks at each stop. That mechanic still failed to win me over. The dragon never visited my table, and my players clearly felt robbed of a final battle that never reached them. They waited for a climax that never came, only hearing about it from a distant part of the room. Organized play leaders must have an outsize love of this gimmick because they tour with the dragon, so they catch all the fun and none of the letdown. To be fair, the mechanic probably works with from three to five tables per boss. Winter Fantasy attracts D&D’s most enthusiastic fans. Players tend to bring their best characters to the Epic adventures, so the tables skew to higher tiers. Of more than 30 tables seated for Reclamation of Phlan, only two played the low tier. I ran an high-tier table, giving me my first chance to pit PCs against an archmage with spells like Time Stop. Luckily for characters, I did not pick the wizard’s spells. Much of the convention, I ran Robert Adducci’s adventure Szith Morcaine Unbound. 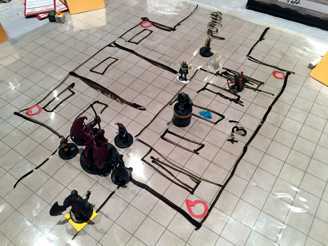 This adventure inspired my post on the value of random chance in a role-playing game session. The expedition proved as fun as I hoped, with lots of paths for the players. Among the passionate fans at Winter Fantasy, I met many who play adventures more than once, and Szith Morcaine Unbound offers variety for multiple runs. In the adventure, the fire giants and their allies did better job of challenging mid-tier characters than the foes in earlier adventures. Robert told me that as the Adventurers League team sees more play, they’ve become better at calibrating challenges for higher-level characters. As expected, the four-hour convention slot required me to steer some of the encounter rolls to finish on time. In a looser setting, the adventure offers enough options for twice the game. 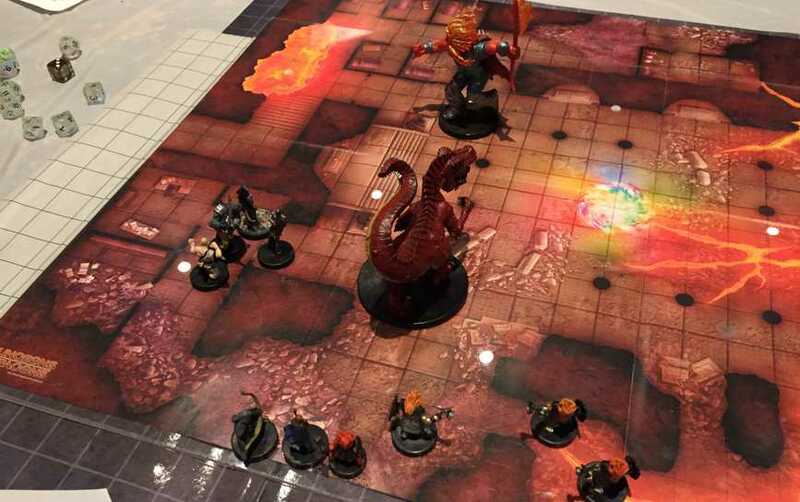 At Gen Con, players who chose the D&D Experience track felt the extra hundred dollars they spent gained little more than a table of six rather than seven. The organizers heard the complaints and strove for a more premium experience. This time, my friends in the Experience liked extra perks such as sessions run by Adventurers League administrators and designer Mike Mearls. John “Radiating Gnome” Jones shared his impressions with me. “The author-only adventures we played were all awesome—challenging, a little different, and playing with the adventure’s writer is a real treat. We had great DMs for all of our D&D Experience games. That’s all for Winter Fantasy 2016. I hope to see you all there next year. This entry was posted in Conventions and tagged Adventurers League, Battle Interactive, GEN CON, Mike Mearls, Origins convention, Robert Adducci, Will Doyle, Winter Fantasy. Bookmark the permalink. Great recap! Worth mentioning that Shadow of the Demon Lord was run there (the game is by Rob Schwalb, near and dear to many for his amazing work on 4E and 5E D&D). I played 2 slots and was left hungry for more. There was also Living Arcanis, including adventures using 5E for their campaign (which normally uses the different Arcanis rules engine). I had a darn epic game of Pathfinder Adventure Card Game – we won on the very last turn! The PF crew they sent was really good – cool people with a great love for the hobby. I thought the Epic was great. It again needed a sound system, but the encounters were great and had a nice interactive feel. I wanted a bit more interactivity that was felt… more of the “and because of that you face this” and the dragon never came to our table either, but that stuff happens. Overall, it was excellent. Will rocked it! I thought this was one of the best WFs in years. I had an absolute blast. One of my few regrets was not getting to game at your table. Let’s fix that in an upcoming con! I left Winter Fantasy wishing I had gained a spot in one of those Shadow of the Demon Lord tables. Living Arcanis slipped under my radar. Thanks for filling in the gaps! Hello, I’m new to Dungeon Mastering, as such a thing was left to my father, allowing my brother and I and enjoy the hijinks associated with PC’s. I now in turn DM for my college friends, who wouldn’t otherwise dedicate the time to run a game. I have found your blog very helpful and inspiring. Anyways, besides Winter Fantasy and GenCon, are there any other major events like this for Dungeons and Dragons?